After Cozumel, I took a nice rest during December and started back again in early January. With the main goal of 2014 being Kona, I needed an early season goal to stay motivated in the early months. 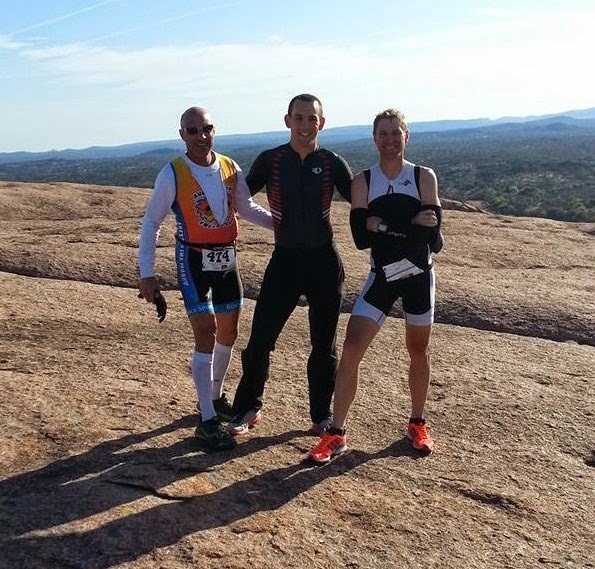 I went into the spring with two goals: defend at the Enchanted Rock Duathlon and win the overall amateur race at Ironman 70.3 New Orleans. I am happy to report that in the last month, both goals were achieved! On March 30, Leah and I returned to Enchanted Rock State Natural Area to defend last year’s title. Race day was perfect, with low morning winds, great temps, and a capacity field once again. The race started out quick, with Sandy Joseph and I separating from the field on the initial 8k trial run. We traded the lead back and forth a few times, and I eventually took the lead for good at mile 4. It was a tough run as always, and Sandy was pushing me hard. Into T1, and out on the bike, I knew that Enlightened Performance athlete and uber biker Michael Jones would be hot on my heels. I pushed a decent pace (295 watts for 40 min for those who care) and came into T2 with a decent-sized lead on the chasing field. Through the woods and up the rock, I managed to hold on for the win. I was really happy to see Michael summit the rock next to take second overall. 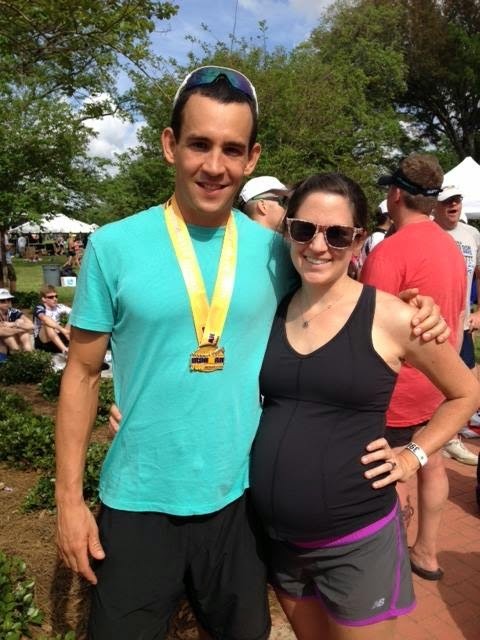 EP athlete and firefighter extraordinaire William Jabour also had a great race and improved his previous year’s time by nearly 8 minutes! I ended up a few seconds shy of the course record. My trusted swim advisor Andrea Fisher defended her title as well on the women’s side. It was a great first race of the year, and the folks at Redemption Race Productions did a great job putting it on, as always! We arrived in New Orleans on Saturday after staying with my college roommate in Baton Rogue. We had a great visit, and I did my riding that day on a pretty amazing tandem that Dan built by hand, a bamboo tandem fixie. That was a lot of fun! 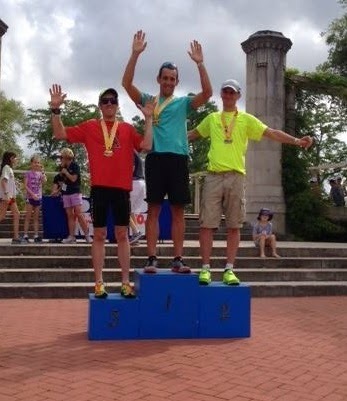 Dan used to be a pro triathlete, and his counsel has always been very valuable to me. Arriving the next day in New Orleans, I pre-rode the bike course and did a quick run. Felt like I had timed the taper pretty well, good sensations on the run, bike not so much, but was ready for a big test! Checked in the bike and headed to early dinner at Olive Garden. Back to the hotel and to bed, I was feeling calm and confident, very few nerves, just an excited feeling of being ready to execute. Up at 4 a.m. for a Nutella banana sandwich and my first regular coffee in four weeks (trying to maximize impact of caffeine on race day; it worked). We headed to the race, set up transition, and waited around for the swim start. The pros were off at 7 a.m., and I downed my BeetElite shot and readied with the rest of the AGers going off time-trial style in the marina. The course was N-shaped, and I was not expecting such a rough swim. The 30-34 age group went off eighth, and with the time trial start, there were already 500 people in the water by the time we entered. It was eight people every 10 seconds, which made for a very crowded course. I had big goals for the swim, as my pool times have improved dramatically over the last five months. However, I was not fully prepared for how chaotic the swim would be. I was swimming over and around people from the first minute until the last. I intentionally didn’t get a split after the swim and was on to the bike. Starting out on the bike course, I had one goal: ride my watts. I knew that if I stuck to the plan, things would go well. Passing people from the start, I stayed focused the whole bike ride, and by mile 45, I was all alone having passed nearly everyone that started in front of me. There was a southeast wind that picked up as the day went on. I felt right at home in the wind and knew that the course was not going to be fast for most. I held a very steady 265 watts for the bike and came in at 2 hours 11 minutes for the 56-mile bike, which was the fastest of the amateurs that day by over three minutes. Coming through T2, Leah gave me the information that there were only two amateurs in front of me. I was confident that if I crossed the line first, there was a good chance I would win, although because of the time trial start, I would have to wait for the remaining 1,500 to finish. I knew at a minimum, if I got passed at all, I had lost! I started out the run strong, holding back and running the first mile in 6:03. This may have been too fast, as it was really starting to heat up, and the course offered very little shade. I was not yet acclimated to the warm, humid weather and paid for it a little on the run. The run was going well, although I was gradually slowing down as my heart rate rose. Having the women pros to chase was motivating, and I kept on as the pain in the legs was slowly building. By mile 8, we were running into the wind, and I was starting to feel pretty rough. I passed the remaining two that were ahead of me by mile 10 and then began the toughest 5k of my life. I had slowed to 6:50 pace at this point, and the wheels were pretty close to falling off. Seeing Leah really helped, and I soldiered on knowing that this was the only chance I had to achieve the goal I had set for myself. I managed to pick it back up the last mile as I completely emptied the tank out there. I ended up running a 1:24 for the half marathon, which was mildly disappointing, but given the conditions, I was happy to have kept it together, even though I positive splitted every mile! That time was good for the third fastest run time overall. After crossing the line, the waiting began! It was a few nervous hours with Leah, but turns out that I had won the overall amateur! In the end, although my time was a few minutes off what I had prepped for, I had trained to win and was very pleased with the effort. Special thanks to my amazing wife Leah and soon-to-be daughter Adelyn! Also to all the Enlightened Performance athletes, Sol Frost, Austin Tri-Cyclist, Rub Massage Austin, ROKA Sports, BeetElite, EnduroPacks, James Cotter, Andrea Fisher, Sarah Trent, and my employer Executive Stamina. Behind every woman on a bike, there’s a story, and we’d like to share those individual stories with you. How they got started, what it means to be a bike racer, who they are on and off the bike... We’re starting close to home with the women of our own team, ATC Racing. Our hope is that in sharing our personal experiences—the good, the bad, the embarrassing—we open the door for other new women racers. ATC Racing is made up of seven very strong and very different personalities. We’re an amateur team, and all of us work a job of some kind (or several). Between us, as Lori Bergeron says in her piece below, there’s one obvious unifying characteristic: we love to race our bikes. Bike racers are short, tall, big as houses, skinny as rails, pretty as a picture, ugly as a post, prissy, butch, quiet, loud. This sport shows you how highly individual a group of people can be. Even age isn’t necessarily a limiter. Anne Flanagan is in her fifties and works part-time as a nurse. Full of energy and wisdom, she’s a beautiful person inside and out, and I think we all wish we could have her looks now, much less 20 years down the road. You’ve got to watch the derogatory grandma comments around her—e.g., “I’m riding like a grandma today”—because she is one. Lori is 30 like me. I have a 10-month-old baby and am by nature very quiet; my typical night is about as exciting as a bingo match. Lori works as a dessert chef (she makes a mean salted caramel) and occasional pedicabber. She goes out, dates, rock climbs, gets new tattoos—a good portion of her barely 5-foot frame is inked. Can anyone be a bike racer? Probably not. If the idea piques your interest, though, that might be a sign you’d enjoy it. 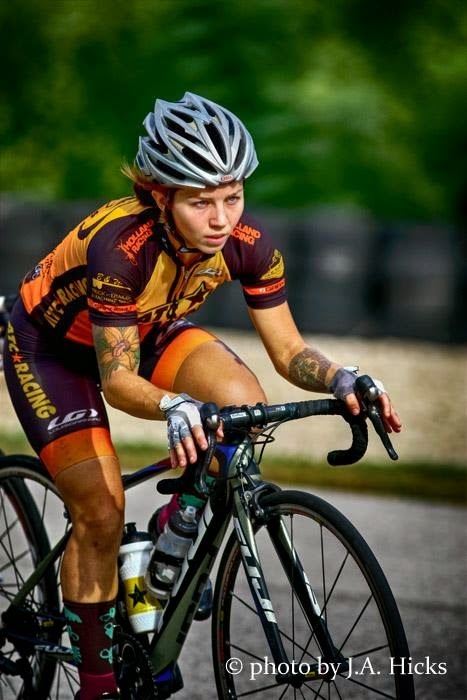 Check out our new nonprofit, the Women’s Racing Foundation of Austin, and read on to learn more about our first two athletes in the spotlight. It is about 100 degrees in the middle of August 2012. I am lined up along with about 10 other women and a few 10- to 16-year-old kids to race my bicycle for the first time. We are at the Driveway, a privately owned racetrack that caters to motorsports, but on Thursday evenings from March to October it is all about racing bikes. Since that day the Driveway has become a weekly ritual, either racing, volunteering, or just spectating. I joined ATC’s women’s racing team, raced some local and out-of-town road races and have generally fallen in love with cycling. This was not supposed to happen to a woman well into her 50s who thought she would be a runner forever. 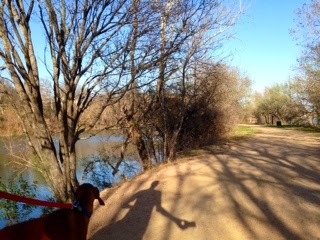 The Town Lake trail was my second home, and the Decker Challenge and the Austin Marathon were my yearly rituals. Cycling was part of my rehab activity after a minor knee surgery. I found a couple of women in the neighborhood who were training for triathlons, and I rode with them on their training rides. Judy and Doray introduced me to Lime Creek, Liberty Hill, and South MoPac loops. They taught me how to eat and drink on the bike, and how to change a tire. They gave me the confidence to ride on Austin roads by myself when I had to. When their training ramped up for IM Texas, I went looking for a ride that wasn’t necessarily 100 miles long. I found the Bagel Ride. I know that those guys wanted me to get lost, but I kept coming back every Saturday. I got dropped plenty of times, got pushed up many hills, and got yelled at for not holding my line, and after about 18 months (yes, it took that long) I felt like I could kind of hang with them, sort of. The Violet Crown guys taught me (still learning) how to ride in a group, stay out of the wind, and ride in a pace line. They taught me about wheels and tires, cassettes and cranks, but the great mystery remains: how does Ted keep his bike so clean? The mentoring in this sport has amazed me; I see it on group rides and at the races. For the most part people are encouraging and supportive and are willing to share what they know with those new to the sport. The camaraderie among the women is phenomenal. I feel blessed to have found this sport, even at this later stage in life. I know that my arthritic knees are happier than they were pounding the pavement, and I hope to be out there for years to come. My hope is to be able to encourage other women who are just getting into cycling through ATC’s newly formed Women’s Racing Foundation of Austin. 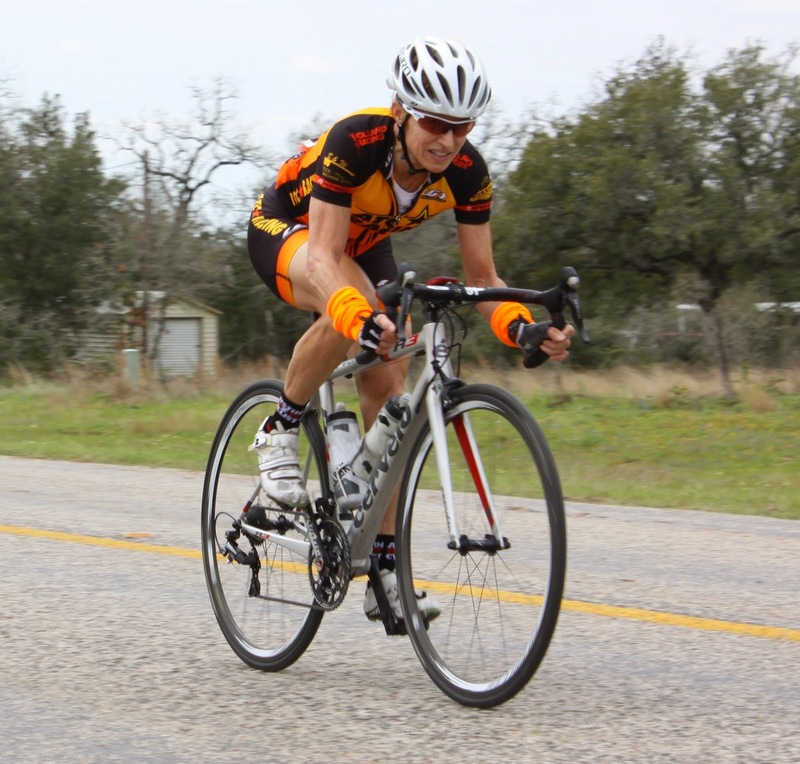 I am in my second season of competitive bike racing. At 26, I picked up a bike for the first time since I was a child, and then shortly thereafter found myself at the Driveway lined up with a group of ladies ready to race. I was wearing tri shorts and a wife beater (gasp!). I lasted a short three laps, feeling like I was hyperventilating. I was instantly in love and ready to get strong! I’ve always liked excitement. The problem is I find joy in a lot of exciting things. Cycling is a sport that requires a lot of time and dedication. It only seemed fitting when I found myself falling in love with crit racing; the short, mind-intensive races are extremely exciting to me and require less endurance. As a racing team, all the ladies I race with have a strength they bring to the team. 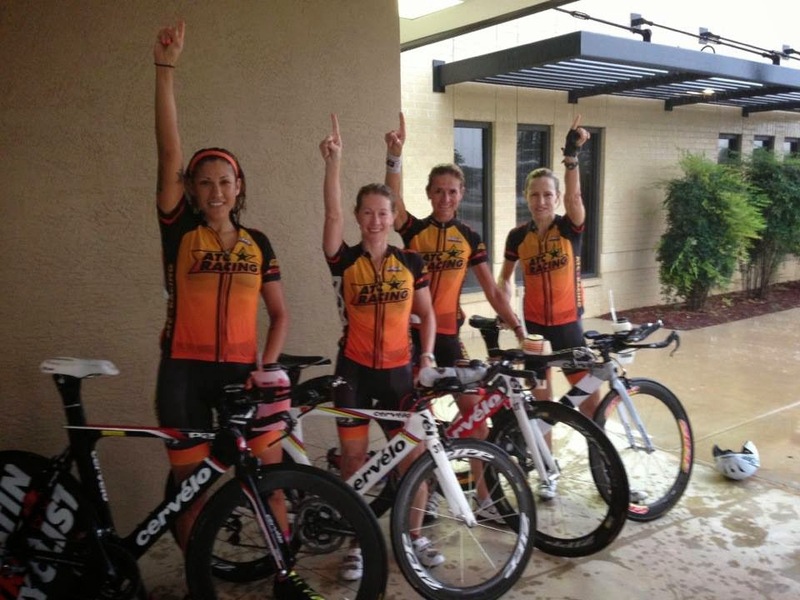 Some ladies kill it time trialing and in road races. 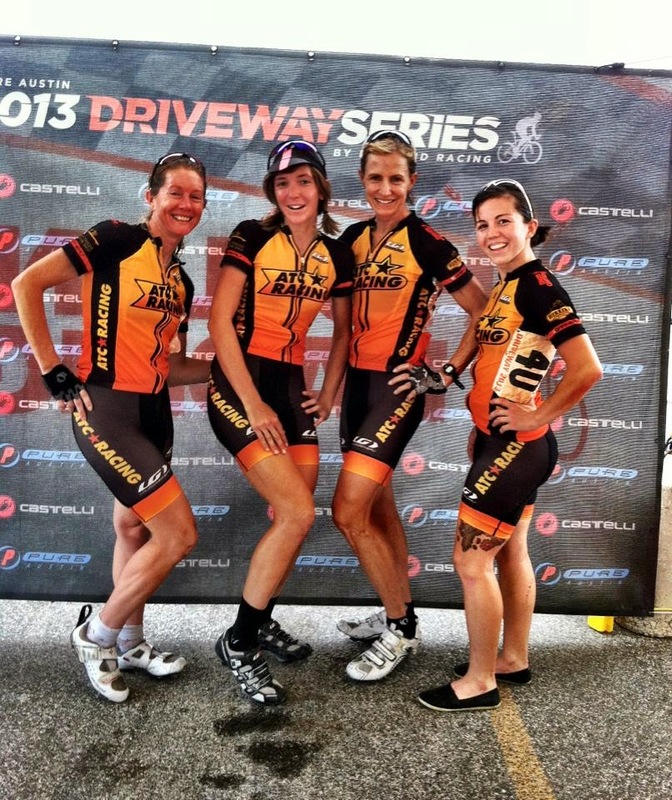 We all love what we do, and I think that is what is most unique about female racers in Austin. We all have this one thing in common: We love riding our bikes. I even enjoy my interval training on my indoor trainer. (Never thought I’d say that!) But being able to watch and feel myself grow athletically is easily one of my favorite things about competitive cycling. Racing is one of the coolest hobbies I have ever found myself involved in. Especially at the Driveway crit in Austin. There is so much fun competition and good people, and there is nothing like the adrenaline rush of riding your bike that fast, learning to handle your bike in tricky situations, and hopefully being one of the first through the finish line! I don’t have a specific goal with cycling or have aspirations of becoming a pro. For me, cycling is about becoming a stronger athlete and person. High-intensity riding teaches me a lot about myself. It is hard to avoid the flow of emotions that come with competition. It has made me more aware of my strengths, my weaknesses, and who I want to become as a friend, an athlete, and a person in general. Cycling creates an emotional and spiritual outlet through physical activity. It takes you to beautiful places and at a speed you can appreciate what’s around you. I ride to work. I ride out in the country and in the rolling hills of Austin. It’s awesome and there is nothing like it. Proudest cycling moment to date? 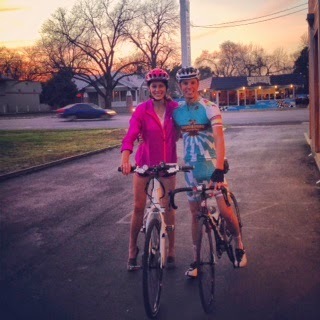 Getting my mom on a bike and training for a triathlon at 58! I get excited to get on my bike every day and to see who I will become every day, and also to learn to grow and become stronger physically and mentally through the amazing world of cycling. I think the story of the tortoise and the hare has always slightly bothered me. Yes, there are great points to take away about patience, persistence, and pacing (that tortoise did have his pace dialed in). BUT, what if that showboating hare had decided to dial it back a tad and not take so many pit stops along the way? I mean all he had to do was take a few less stops and BAM, victory would have been his. A lot of us can relate to both of these characters. There are the tortoises who click off miles after miles of training, but they always play it safe and never push their limits. They get great benefit from developing their aerobic systems and being able to handle the miles, but there is definitely something missing in their training. On the other hand, you have the hares that can’t wait to hit the track, mash the pedals, and do a few massive sessions in the pool, only to end up sidelined by injury and burnout. It’s a fine line we must walk to get the right mix of slow and steady, and quick and intense. The most important thing is to make sure you are getting some sort of mix in your training. Adding in a group ride/run or masters swim is a great way to mix things up and add controlled intensity (okay, not always controlled—see ATC World Champs Saturday ride) to your training. If you feel like you have been pushing a little too much, don’t be afraid to slow things down. I’ll go on "family runs" with my wife and dog when I know I need to go easy. It’s a great way to keep me in check, and it’s always nice to have their company. 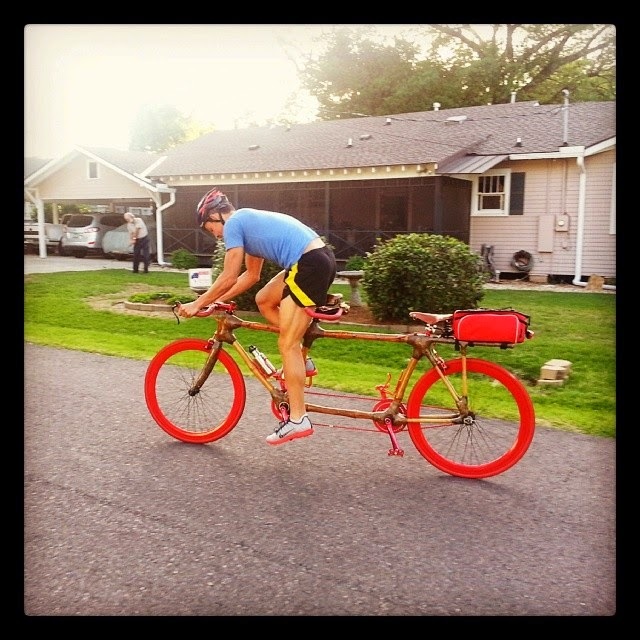 Now that ATC got my brother set up on a new Cannondale bike, I'll be reaching out to him for more fun training options. Make it an opportunity to run with a friend who’s just starting out, or someone you usually don’t get to train with. Finding the best mix and balance for you is crucial to long-term growth, health, and probably overall happiness in your training. I’m still learning to find the right mix for me. After noting my injury free streak of 2013, I started 2014 at the other end of the spectrum, injured. I was eager to build on 2013, and also looking for ways to become less tortoise-like and more hare-like. The hare in me definitely came out and I ended up sidelined from running for a good two months. Yay for 2014! I plan to learn from these mistakes going forward and will be more patient in my build back to fitness. While most people are racing or getting ready for their first race of the year, I’m channeling my inner tortoise to patiently build my way back to competing. As the ever controversial Brett Sutton once said, "hurry slowly." Warmer weather has arrived and finally looks to be staying. Even for the most reluctant seasonal swimmer, the winter hiatus from the water is over: it's time to work on your inner fish. Unlike fish, however, you'll probably need to stock up on some equipment to get the job done. We asked ATC owner and avid swimmer Missy Ruthven for tips about what we should have on our shopping list. Goggles: ATC has many different styles, brands, lens colors, and prescriptions (yes, prescription goggles at ATC! ), with samples to try on in store. Most are of a one-piece construction, but some have different-sized nose bridges in the package to change out for the perfect fit. A few goggle manufacturers, such as TYR Special Ops and Zoggs, now offer polarized lenses. Some swimmers prefer the mask-style "goggle" for open water—ATC also has a variety of these, including AquaSphere, Zoggs, and more. Tips: A good fit is a goggle that sticks to the face (you'll feel a little suction) without the strap. DO NOT rub the inside of the goggles. All new goggles come with anti-fog on or embedded in the lens, and rubbing the lens smears it and/or makes the anti-fog ineffective. Caps: Though not necessary or preferred for some swimmers, caps are required in triathlon. Silicone caps are the most popular because they don't pull the hair as much and are very durable. ATC also carries thermal caps for the cold water (50s to low 60s). Lycra caps are a good choice for swimmers who don't like as tight of a fit in their cap and mostly just want to keep the hair out of their face. None of the caps keep your hair dry. Swimsuits: ATC just got a big shipment of new swimsuits in, offering many different styles to choose from: for men, brief, square leg, and jammers; for women, one-piece, two-piece, full back coverage, and one piece with shorts. Brands include TYR, Speedo, AquaSphere, Rocket Science Sports, Sugoi, and Nike. Almost all the suits are made of chlorine-resistant fabric, so they last much longer than the typical Lycra suit. Wetsuits: A wetsuit is a must when the water is cold, and it's a marked performance advantage when a race allows them. Look for an in-depth wetsuit article to come soon. Wetsuits are available for rent and purchase at ATC year-round. Hand paddles: These are the rigid plastic “hands” athletes use to build swim-specific strength. Using them can also help teach proper technique. Missy says her personal favorite is the Agility Paddle from Finis (check out Brandon Marsh's review), but ATC carries several different options in all sizes. Tips: Paddle size is dependent on hand size (ideally, the paddle should be a little bigger than your hand) and experience level in swimming. Beginners should get smaller paddles to avoid the risk of hurting their shoulders. Pull Buoy: These are often paired with the use of hand paddles. A pull buoy is worn between the legs (near the crotch) to elevate the legs and hips, resulting in better body position in the water. Try to copy this position when not using the pull buoy. Tip: Don’t kick while using the pull buoy. Fins: There are basically two kinds of swim fins: traditional “long” fins and the newer, very popular “short” fins. Missy prefers the shorter fin, as she feels the blade allows for a more natural kick. The purpose of fins is to a) keep speed up while doing swim drills, b) build strength in kick-specific muscles, and c) feel what faster swimming is like. Tip: You can use a kickboard while kicking (most people do), but Missy prefers not to use the board, instead kicking on her side with her bottom arm extended. She switches sides when she needs to take a breath. Snorkels: Many swimmers are using these to work on their technique and body position without the interruption of turning the head to breathe. Finis makes a couple of different models. 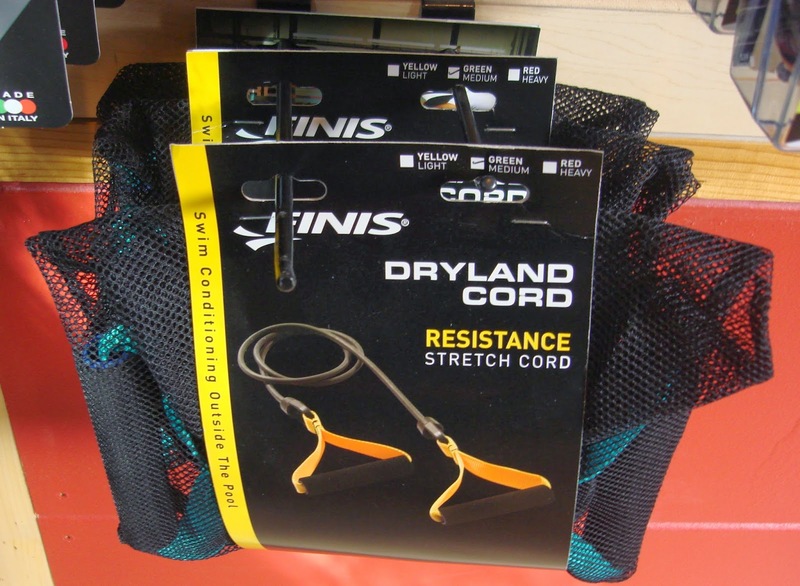 Dry Land “Stretch Cords”: Can’t get to the pool? The name gives you a good indication of what the cords do—they're stretchy bands with handles that are anchored on something solid in front of you; you bend at the waist and practice your swim technique. They're a surprisingly effective way to build strength. Water Radios / MP3 Players: Listen to motivating tunes while you swim. Swimovate: These watches will calculate distance (by counting your laps; they don't use GPS). The watch will even tell you what stroke was swum (and the time, distance in each stroke). More elaborate levels of the watch have the ability to upload information to your home computer for analysis. ATC's full inventory isn't listed online, so check out the swim center at Barton Springs or ATC 360 in person for more products!